Pie crust from scratch makes a pie extra special. The Authentic Foods Pie Crust Mix creates a flaky pie crust that is easy to handle and bakes beautifully. The blend of Authentic Foods Superfine Brown Rice Flour, Authentic Foods Almond Meal and a touch of cinnamon is ideal for all kinds of pies. 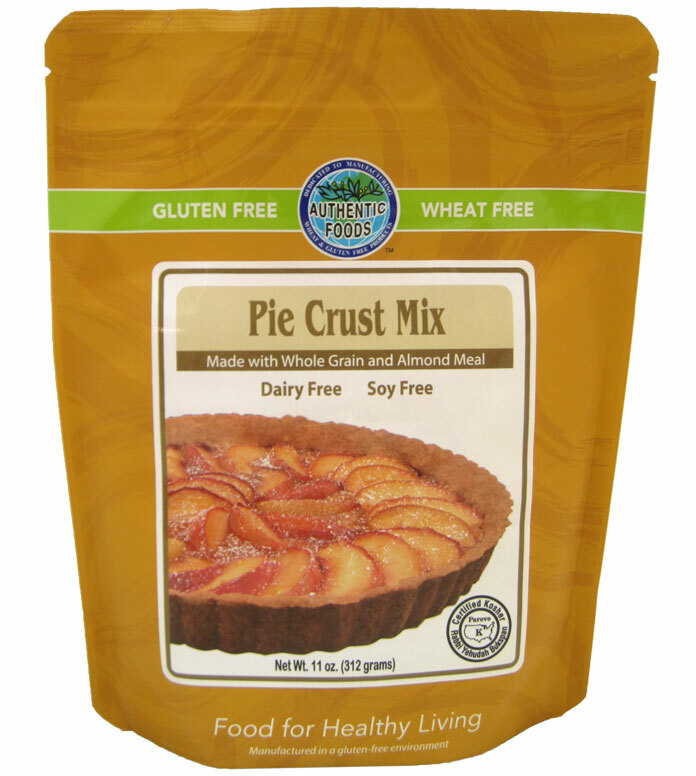 Whether you are trying to make a savory pie, a quiche, or sweet pie this mix will help make the perfect crust. Adding a little pizzazz to your pies is now easier than ever with our no fail recipe made easily with ingredients found in most kitchens. Add egg yolk, cream (or non-dairy cream) and butter, roll the dough, lay it on a pie pan, bake and voila! This mix makes one pie crust. In a small bowl, mix the egg yolk and cream; then set aside. Using an electric mixer cream the butter or shortening for about 1 minute. Then mix in the pie crust mix until evenly distributed. Add the egg mixture and beat at low speed until the dough pulls away from the side of the bowl. Add an extra tablespoon of cream if necessary. Remove the dough from the bowl and form it into a ball. Place the dough on a silpat baking sheet (if you don’t have a silpat baking sheet, you can place the dough on wax paper taped onto a hard, flat surface). Then flatten the dough using your hands. With a rolling pin, roll from the center of the dough to the edge of the dough with light, even strokes, forming a circle about 12 inches in diameter and about � inch thick. Place a 9 inch pie pan in the center of the dough and flip it with the pie crust dough over. Trim the edges of the pie crust dough. Then prick the bottom and sides with a fork. For a cooked filling, bake the pie crust for 15 minutes or until golden brown. If the pie will be baked again, bake the pie for 5 minutes in the oven. Then place the filling in the pie and bake again for the instructed time.